Now that our backyard is officially ready for sumer, it’s time to start thinking about some of the details! With our newly decorated Outdoor Living Space and our new picnic table, I have a feeling we are going to have guests over more often! 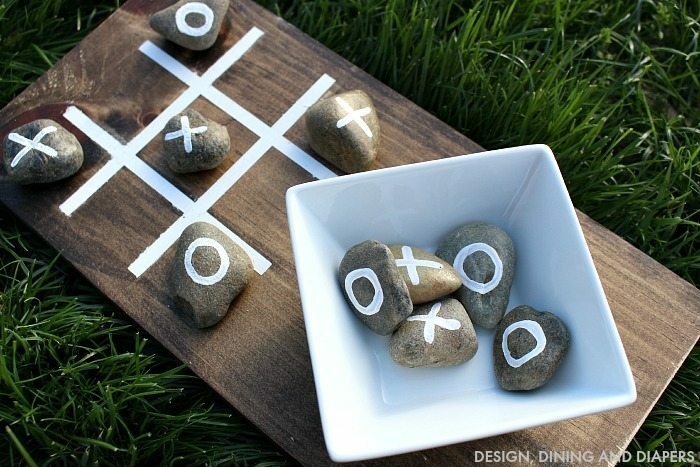 We don’t have a lot of games, so I thought it would be fun to make an Outdoor Tic Tac Toe Game using natural elements. 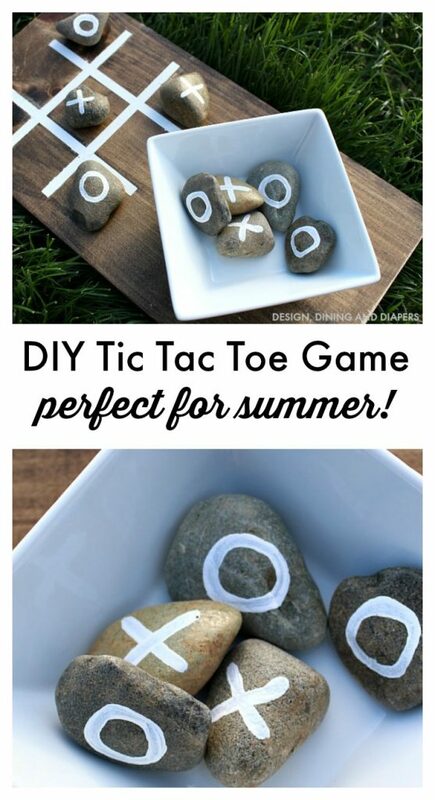 I created this simple game just using scrap wood and rocks from the backyard. 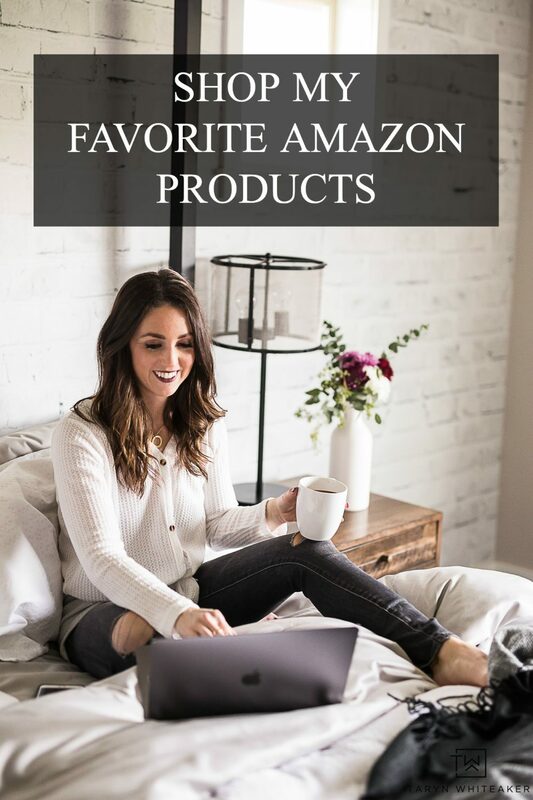 It’s inexpensive and provides great entertainment for all ages. Keep it in the backyard for BBQ’s, bring it camping or simply play a game with the kiddos. This project is one of the many reasons why I save all of my scraps from previous projects. I had this piece left over from the Wood Striped Wall we put in my son’s room and it was perfect for this project! 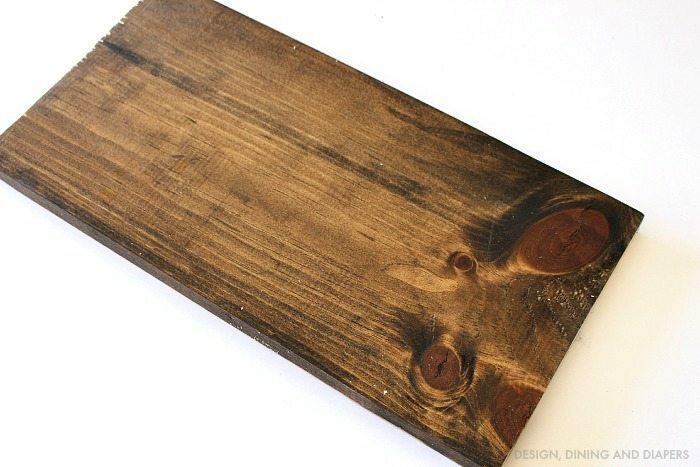 You can recreate this look by cutting a piece of wood to 14X8″ and then staining it in Dark Walnut. 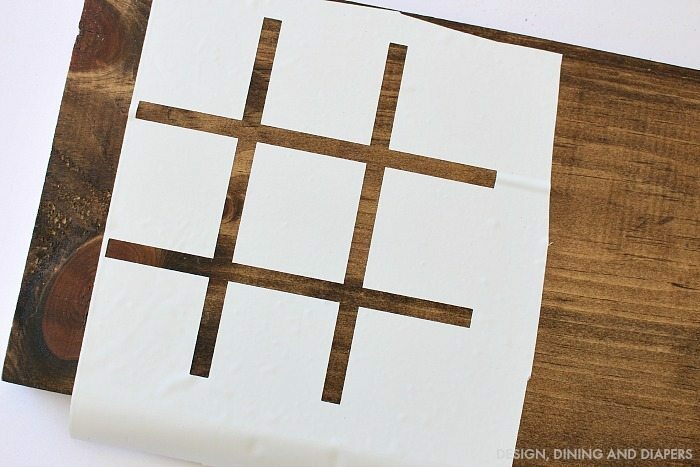 I don’t have a steady hand, so I used my Silhouette to create a stencil for the tic tac toe board and then painted it white. 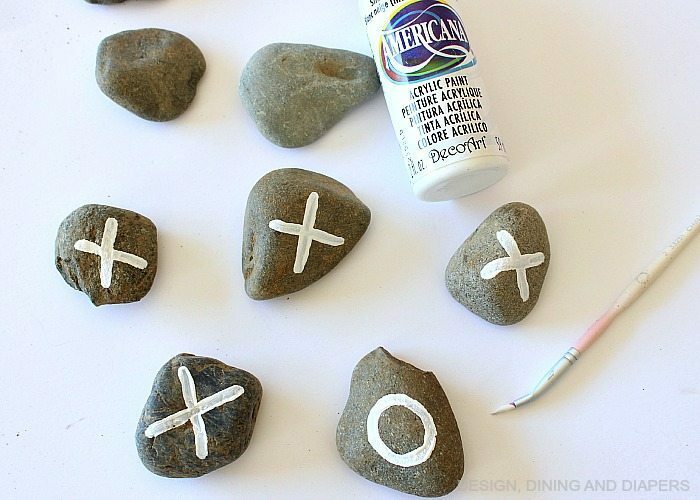 Lastly, I went out in the backyard and collected 10 rocks that had a smooth surface and painted 5 ‘O’s and 5 ‘X’s. To seal both the rocks and the wood, I gave them a coat of polyurethane. I placed a bowl on the board to hold all of the rocks. You can secure this by using an industrial adhesive (Elmer’s ProBond is my favorite). 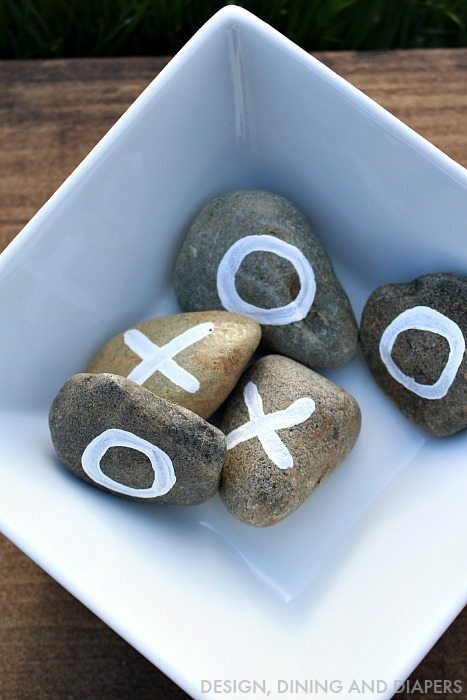 I love this idea – so cute and simple! Thanks for sharing your crafty inspiration on this week’s Monday Funday Party! 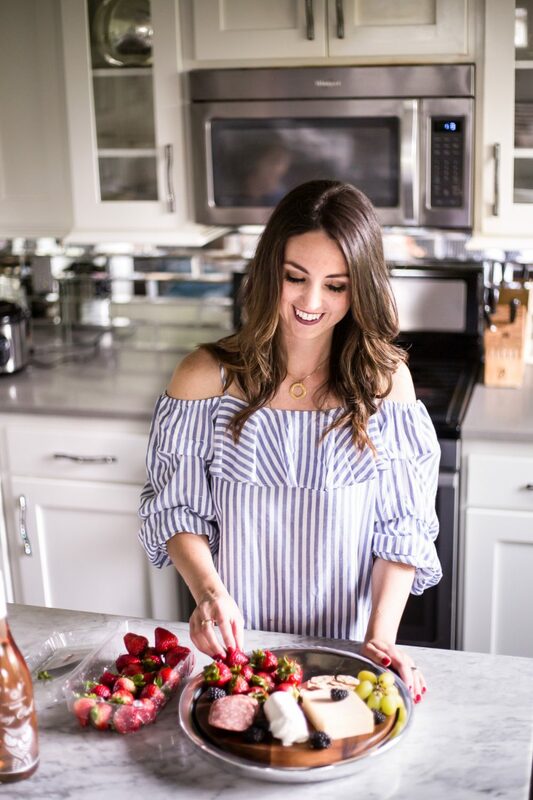 Such a fun and easy DIY! Great game to play for a quiet evening on the patio with the kids! I made this with my class for Fathers Day with some old wood off cuts my husband had in his shed. We painted them bright primary colours and they looked fabulous. The kids loved that they were making something they could do together with Daddy! Thanks for the great idea. Oh I am SO happy you came back to leave this comment, it means so much. I’m so glad they all enjoyed it.